The distance between the Earth and the Sun is known as an astronomical unit (AU). It is about 93 million miles, or 150 million kilometers. Suppose the distance between the Sun and the Earth was the length of your foot (about 30 centimeters). On that scale the Sun would be the size of a BB just two millimeters wide. At two steps from the Sun, we are past the orbit of Mars. 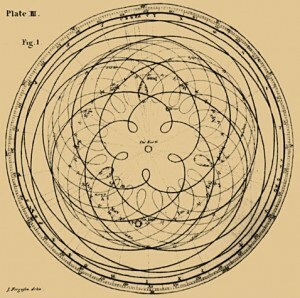 At five, we are near Jupiter, and at ten steps we’ve reached Saturn. At this point we are not even halfway out of our planetary system. Uranus is about 19 steps from the Sun, and Neptune is about 30. Voyager 1, the most distant human-made object, is about 126 steps from the Sun. It has reached the heliopause, which is sometimes referred to as the edge of the solar system, but the real edge of the solar system is likely the Oort cloud, which is about 50,000 steps out. On our scale that would be about ten miles away from the BB-sized Sun. The nearest star from the Sun, Proxima Centauri, is about 275,000 steps away, or a bit more than 50 miles away. That’s such a huge distance that we should probably change our scale. Typically we use a unit known as a parsec. Proxima Centauri is 1.3 parsecs away from the Sun. So lets define the length of our foot to be 1 parsec. This means each step is about 40 miles in our old scale. On our new scale, the solar system (defined as the width of the Oort cloud) is about half a step wide. One step from the Sun gets us almost to the closest star. Within ten steps there are more than 50 stars. About 400 steps takes us to the Orion Nebula, where new stars are being formed. The center of our galaxy is about 8,300 steps from the Sun, or about 1.5 miles. The Milky Way itself is about 7 miles wide on this scale. The large Magellanic cloud, a small irregular satellite galaxy to our Milky Way, is more than 48,000 steps away, or about 9 miles away from the Sun. If we consider this to be a new scale, the Milky Way and its satellites are about the length of a foot. On this new scale, the Andromeda galaxy (the closest spiral galaxy) is about 25 steps away from the Sun. Within about 50 steps we have reached the edge of our local cluster of galaxies, which includes Andromeda, the Milky Way and about 50 other galaxies. Our local cluster is part of a supercluster of galactic clusters known as the Virgo cluster. The edge of this supercluster is about 500 steps from the Sun. Beyond this lies the rest of the universe, but by this point the expansion of the universe makes distance a fuzzy term. 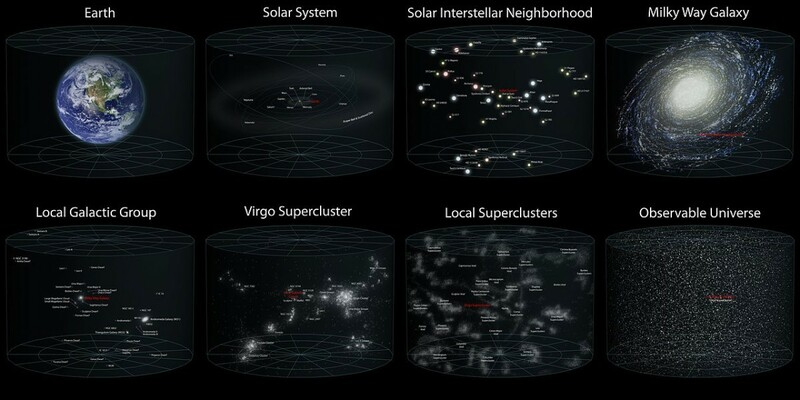 So we can consider the supercluster to be the limit of our cosmic neighborhood. If we go back to our original scale, where the Sun is the size of a BB, then the Virgo supercluster is a bit bigger than the orbit of Jupiter. Of course we live on a speck of dust orbiting the BB.